You are currently browsing the tag archive for the ‘Tempe Reserve’ tag. Go elsewhere little fairy martins! A lot of money was spent preventing the little fairy martins from building their nests here. 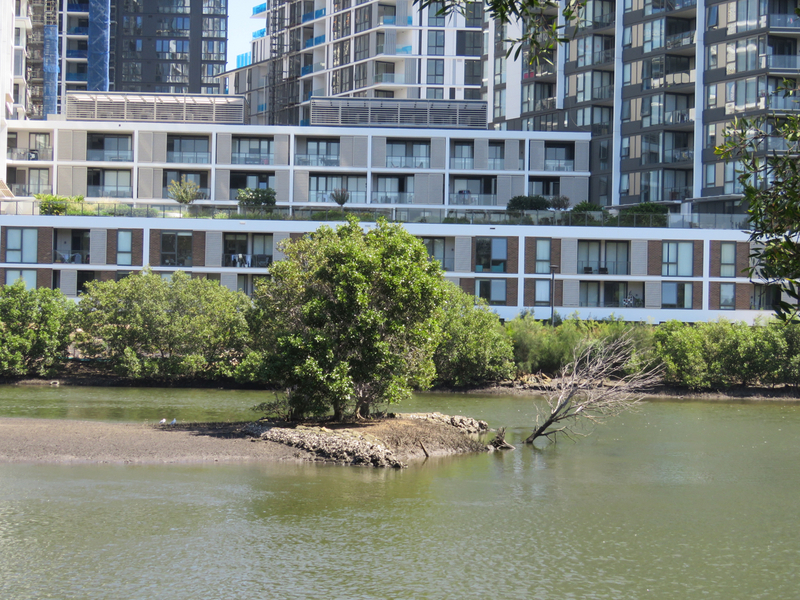 We cycled through Tempe Reserve yesterday & saw something that made us both feel very disappointed. Both kiosks have had what appears to be deterrents attached to prevent fairy martins from building their mud nests. Chicken wire has been neatly & firmly attached to every part of the kiosk roof where the birds might try to build a nest. I mean meters & metres of the stuff. 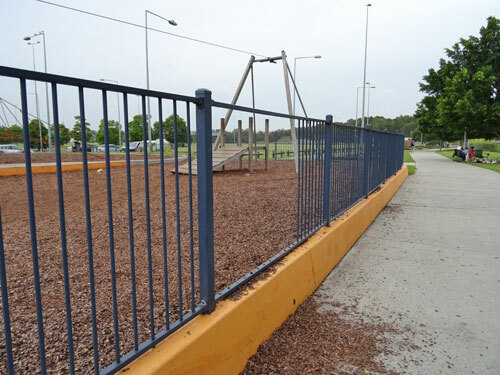 The Inner West Council – Marrickville invested a lot of ratepayers’ money to produce a neat & solid outcome. I checked on google & yes, chicken wire is used in place of plastic netting to prevent birds from building mud nests. I have not seen any reports that the birds are using the purpose-built structures in the wetland. I looked late last year & there was no sign of mud nests, but this may take time anyway. 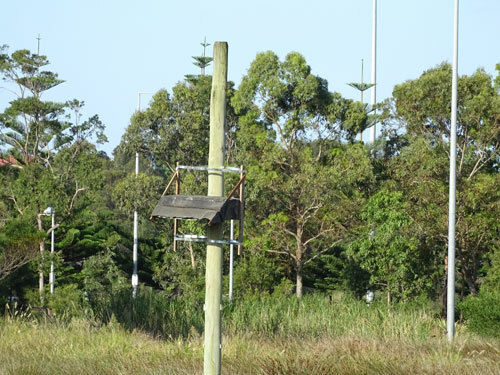 This year Council has confirmed that humans have exclusive rights over the wildlife in open parklands by ensuring the fairy martins cannot build their nests at the kiosks. I feel sad about this & think it was a poor decision by Council. These nests are a perfect opportunity to educate the public about wildlife. The mud nests are interesting in themselves & offer us a look at something quite lovely that is happening in the park. I had not seen these birds up close until I saw one sitting in a mud nest. Indeed, that was the first time I had seen a mud nest. Not surprising as these tiny birds are the only Australian bird to build bottle-shaped nests out of mud. Instead of blocking off the kiosk in a better way this year & that includes adding bollards to prevent cars from entering into the park so they cannot be used by selfish vandals to pull down fences, Council has elected to oust the birds. Even today there was a car near the wetland. The driver was having problems because of the drilling by the WestConnex Authority happening that was blocking his ability to drive down the shared pathway, but I digress. Instead of talking with local schools & having onsite education with school children about fairy martins & the importance of biodiversity, council has decided to oust the birds. Instead of deciding to educate the general community on the importance of biodiversity, council has decided to oust the birds. Instead of having a Ranger around for the nesting period, council has decided to oust the birds. This is an example where biodiversity is important on paper, but not in real life. 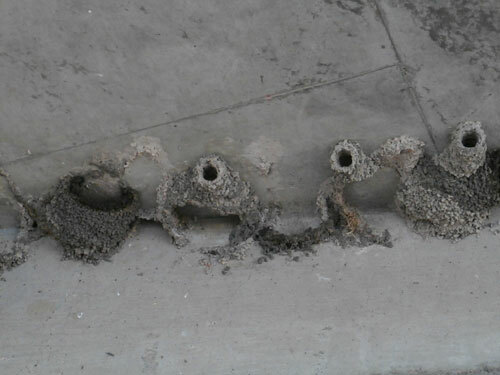 Vandalised fairy martin mud nests in the same kiosk. Photo 2013. Three stumps in Beauchamp Street Marrickville. To me it looks like the removal of the trees was not authorised. Poor photo sorry, but Council has planted two trees to replace the three trees that appear to have been removed without authority in Beauchamp Street Marrickville. 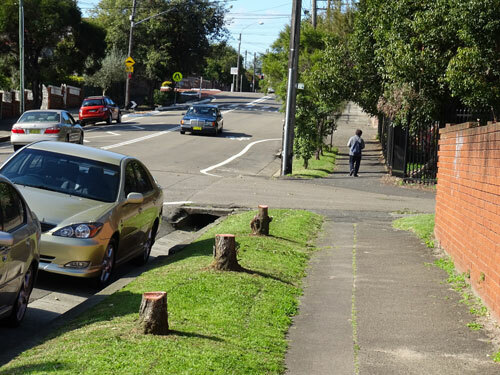 On 15th September 2015 a Press Release from Marrickville Council said that they planted the last of 500 street trees the previous day, a Golden Penda. This is the first time that I am aware that Marrickville Council has published the number of street trees they got into the ground for the planting season. I am very pleased & thank Council for publicly releasing this information. 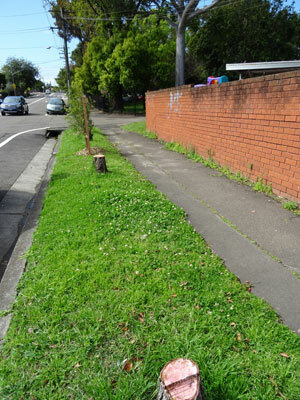 Mayor Gardiner said in the Press Release – “Trees are amongst Marrickville’s most important assets.” I can only agree. “It is my belief that if you want environmentally responsible adults, you need to teach them the value of the environment while they are children. Therefore I was very happy to read further on in the Press Release that earlier this year Marrickville Council decided they would participate in the ‘One Child One Tree’ initiative. As a community we should be proud of this. I would love to know just how many children we have in Marrickville LGA. Council donated 70-mature trees to our local schools on National Schools Tree Day 2015. Again, this is terrific & will help green our municipality, as well as educating our children on the benefits of nature. The Press Release also spoke about Council’s participation on National Tree Day on 26th July 2015. Reading this I realized that I have been remiss & had forgotten to post about the event in Tempe Reserve despite visiting the site later that day. I participated in the event at Sydney Park. 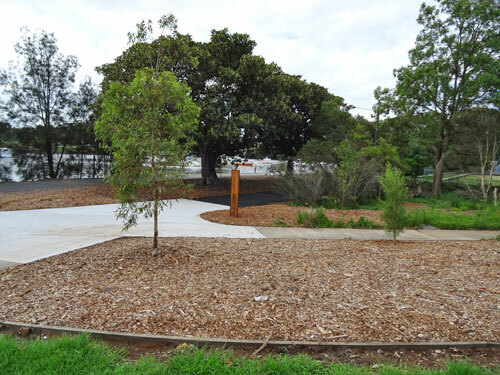 Marrickville Council’s National Tree Day site for 2015 is on the left side & behind the kiosk that sits alone to the left of the saltwater wetland. A small section on the other side of the path behind the kiosk was also included. 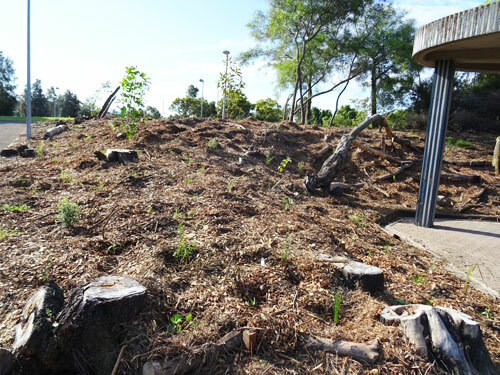 Logs from the felled wattle trees have been used to help prevent erosion in the area behind the kiosk. Dead logs also provide habitat for flora & fauna, as well as add to the soil as they decay. 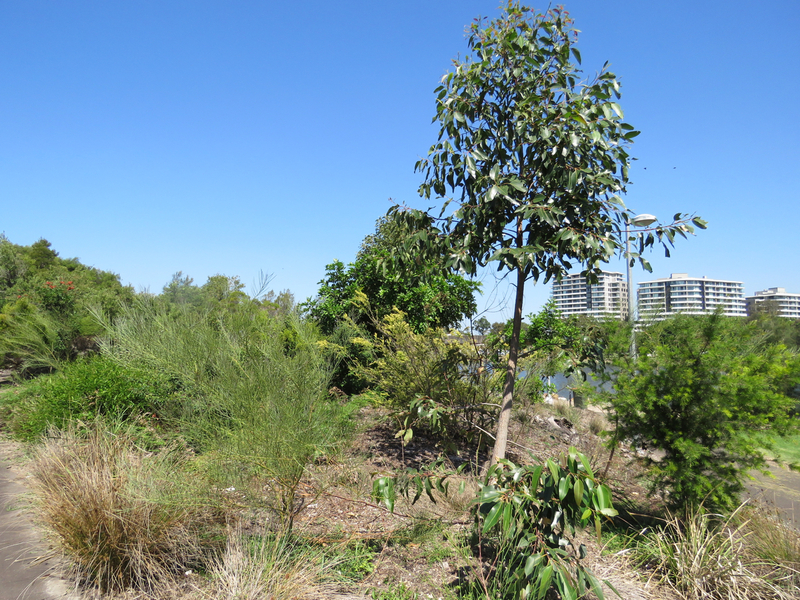 Unfortunately, many of the wattle trees in Tempe Reserve had reached the end of their relatively short lives, as they had all been planted at the same time when the park was created. The kiosk was surrounded by a significant number of wattle trees. 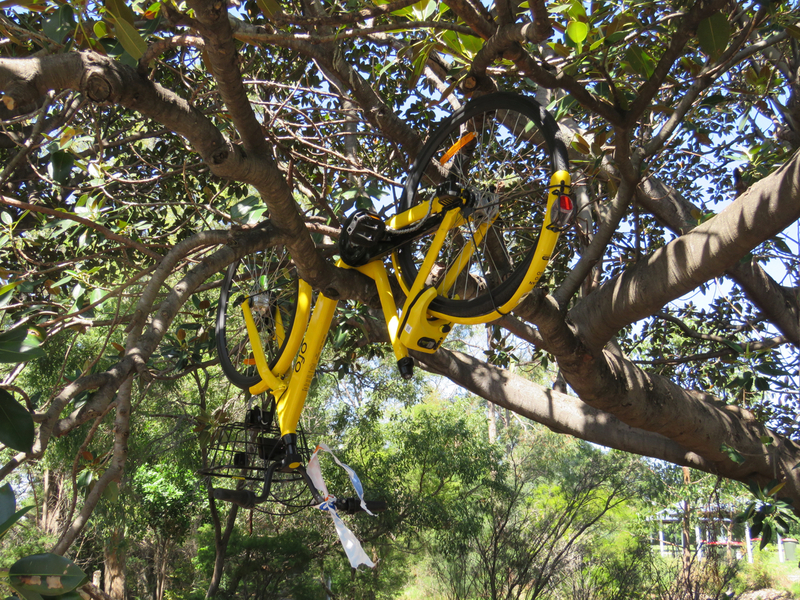 Every time we cycled past, another wattle tree was down or dying. The area looked like a war zone in the end with dead tree trunks & weeds everywhere, so it was a great choice of site for National Tree Day. Council and/or the community planted 7 new trees & all were a good size, which I believe lessens the chance of vandalism. They were untouched 2-3 weeks ago when we last cycled past. I don’t know how many community members attended, how many plants or even what kind of plants were planted. The site looks mulched & cared for. The new trees will look terrific once grown & will most certainly be visible from many vantages from across the Cooks River. They are all natives & therefore will be a source of habitat & food for local wildlife. My thanks to Council & also to the community who participated. 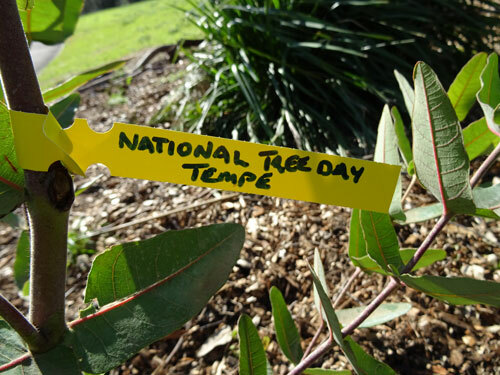 Showing four new trees planted around the kiosk in Tempe Reserve for National Tree Day. . There are also plants in the mulched areas, but being small are hard to see in this photo. The area behind this photo was the 2011 National Tree Day site. Sam area as the above photo, but looking from the bottom of the slope. 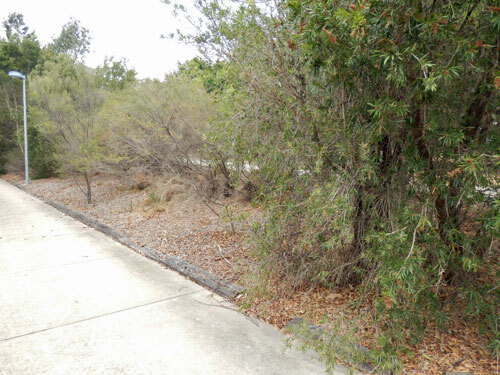 Area of planting on the other side of the path at Tempe Reserve. This was the 2011 National Tree Day site. New tree planted in the area opposite the path behind the kiosk. 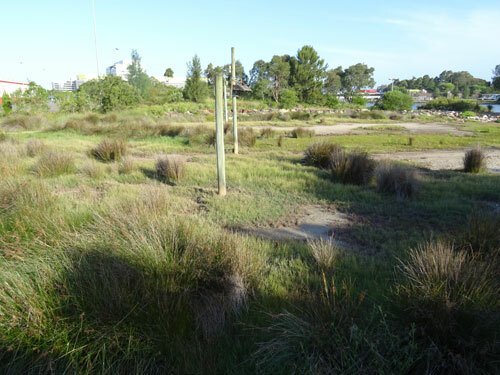 The saltwater wetland in Tempe Recreation Reserve now has purpose-built roofs for Fairy martins. You have to be observant to notice them, which may help save their mud nests from vandals. What do you do when you have vandals destroying your work to help nature & wildlife? 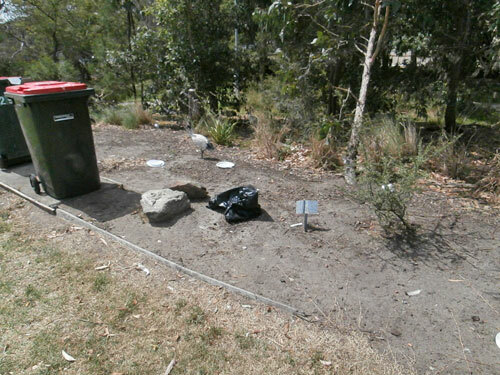 You do what Marrickville Council has done – persist with your initiative & outsmart the vandal/s. 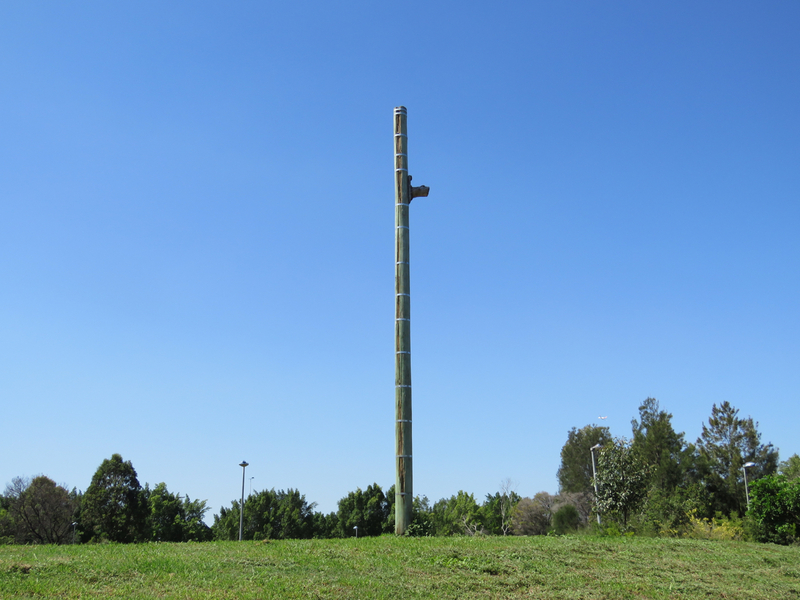 I was really pleased to see that Marrickville Council has installed two roof-like structures on the poles in the saltwater wetland at Tempe Reserve. They have done this to offer a safe place for the Fairy Martins to build their mud nests – away from the vandals. 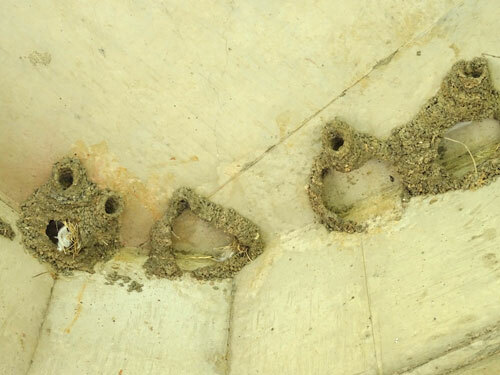 The Fairy Martins have been building their mud nests under the concrete roofs of two picnic kiosks, but despite fencing erected to keep people out for a short period of their nesting season, people still destroyed the nests & broke the eggs. Last season, one or more people, spent a lot of time & energy destroying the cyclone fencing erected around the kiosk. If they could have set fire to it, I am sure they would have. With such disregard for wildlife Council had a choice to give up & allow the vandal/s to win or to become more inventive. They chose the latter & I am very happy about this. I am sick of vandals destroying or marring the streetscape & our parks. There seems to be few places where vandals have not left their mark & it appears to be getting worse. I find it sad to see what I think is a disconnection to nature & beauty. 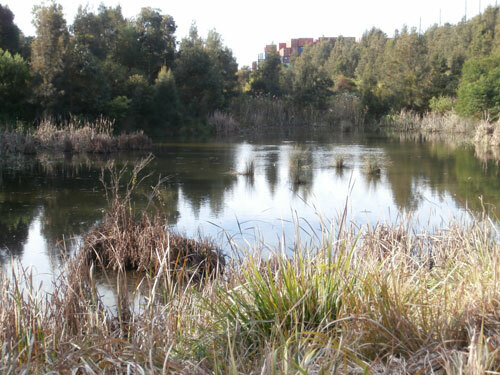 The Saltwater wetland is an endangered ecological community & occupies a large area of the southern side of Tempe Reserve. It looks dry most of the time, but during those seasons where the tide becomes high, it transforms into a small shallow lake. I was once quite surprised to see a very large black fish swimming in the shallow water. He was just as surprised to see me. The wetland is a great supporter of biodiversity in this park & many birds hunt for food here. Most of the time people leave the wetland alone, though some fools drove vehicles through it in 2012. Their tyre marks are still visible after all this time, showing just how fragile this environment is. Because this area generally has little human interaction, there is a really good chance that the vandals will leave the Fairy Martin mud nests alone. We can hope. I think the structures will be successful because the poles are difficult for people to get to & they are unobtrusive, blending successfully into the visual landscape. You would need to be observant to notice them. Council has used lead flashing to create a waterproof roof with deep eaves. The space underneath offers plenty of room for mud nests & also protection from the elements. I suspect the Fairy Martins will like these structures very much. I hope so, because more Fairy Martins can only be a good thing. They are sweet little birds (up to 12 cm) that help humans by eating insects such as mosquitoes. You have probably seen them chasing insects around the tops of trees or swooping low over park lawns. They are the only Australian bird to build a bottle-shaped nest out of mud. Their breeding season is June to December, so these structures allow them more time to breed, as the fencing was to be for a shorter period. Two small nesting cylindrical nesting boxes have also been attached to the poles above the roof structures. I am sure these will be appreciated also. Thank you to Marrickville Council for persisting in your attempts to protect these birds & allow them the ability to build nests & rear their young in safety. A closer view. They blend in well. One view with smaller nesting box above. From behind. A simpole simple design, but will do the job for the birds. 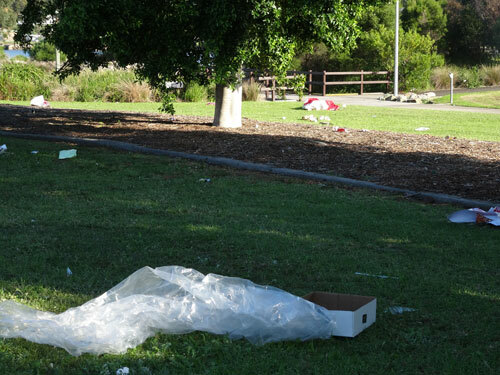 Tempe Reserve vandalised yet again! 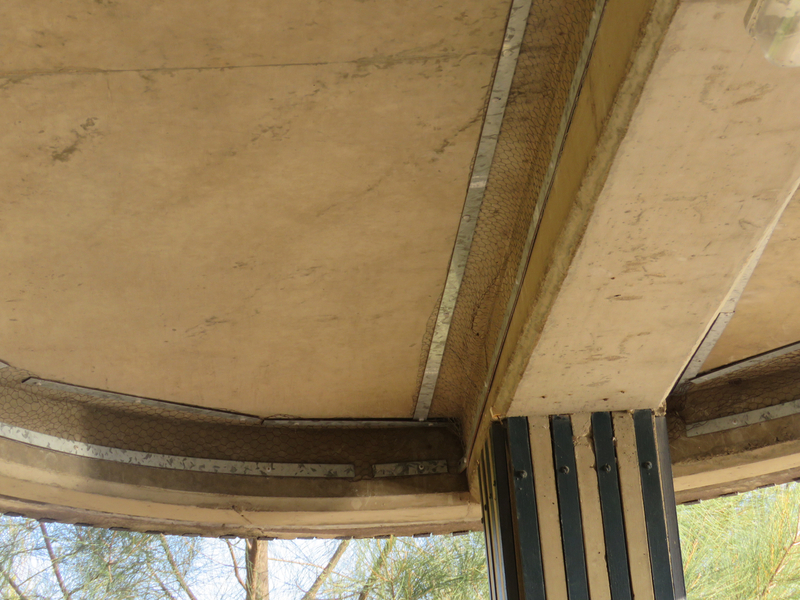 I was aghast to learn that the fencing placed around a picnic kiosk in Tempe Reserve to protect the Fairy Martin nests was vandalized. I went to have a look & was even more shocked at what I saw. Whoever removed the fencing would have needed to use a lot of strength & time because they bent thick steel poles that had been buried into the ground. Some of the poles had been broken. The fencing had been strewn on the ground around the kiosk. Even worse was that all of the Fairy Martin mud nests had been deliberately destroyed. They clearly set out to do a malicious thing. 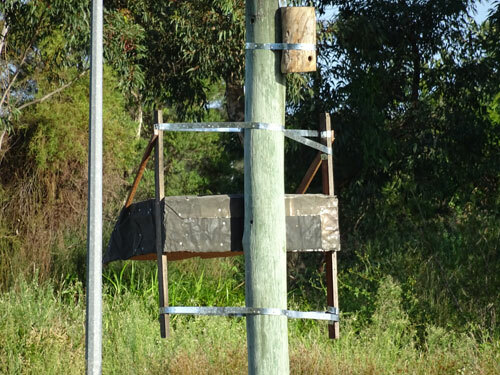 Council has been monitoring the Fairy Martins since nesting season started last October. They placed signage about the birds & one clutch was successfully reared. Then a person or persons smashed the nests again. 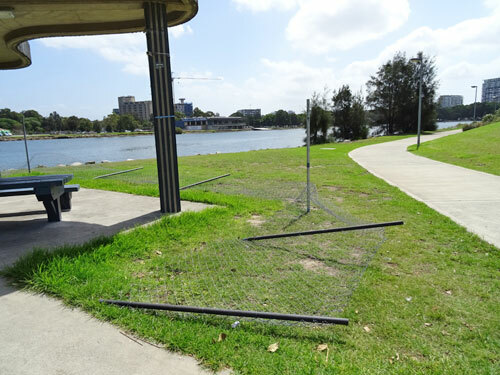 Because there were still active nests with 5-6 chicks, Council decided to erect temporarily fencing around the picnic kiosk. They did this on the 19th December 2014. On the weekend of 26 -28th December 2014 this fence and the remaining mud nests were destroyed. According to Council some of these nests had chicks inside & some were empty. 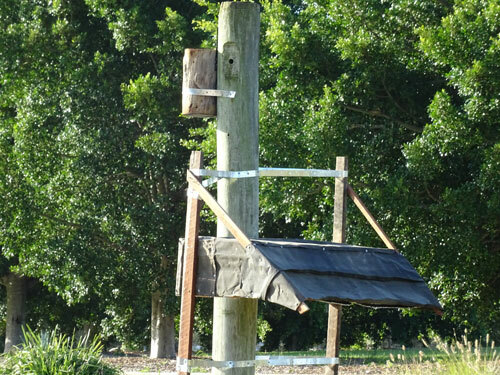 Council plans to install purpose built fairy martin shelters on the large wooden poles in the saltmarsh area. These will be installed in January 2015. 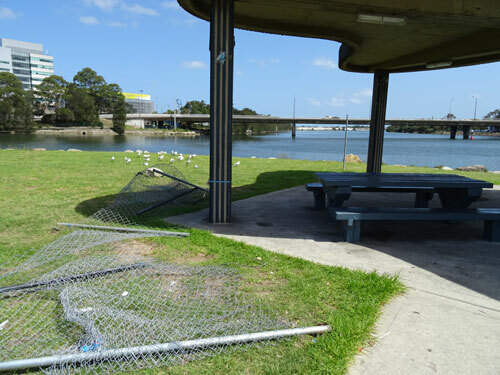 Council has not given up protecting these birds in the picnic kiosks & will be looking for better protection for them during the 2015 nesting season. 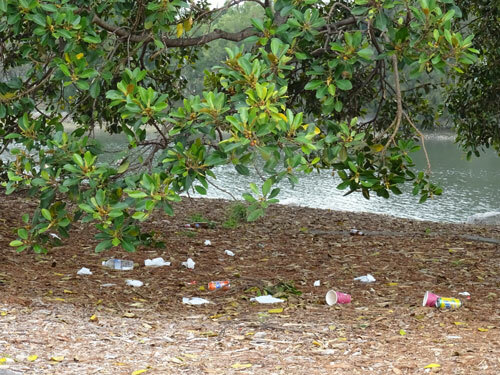 Tempe Reserve makes me despair at the way people treat the environment, so I can only imagine how distressing it must be for Council staff trying to do the right thing to protect wildlife. There is something very sad about people who come to a place because of its beauty, but have no conscience leaving a huge mess behind. They are terrible role models to their children on how to treat public spaces, the environment & wildlife. I thank Marrickville Council for what they are doing for the Fairy Martins & hope that the users of this park respect any future protective measures. I am very pleased that Council keeps up its effort to protect wildlife from malicious humans, whose behaviour clearly shows they do not deserve access to this park. Male Magpie-lark settling in to do a shift of sitting on the nest. He is standing up & so more visible than usual. 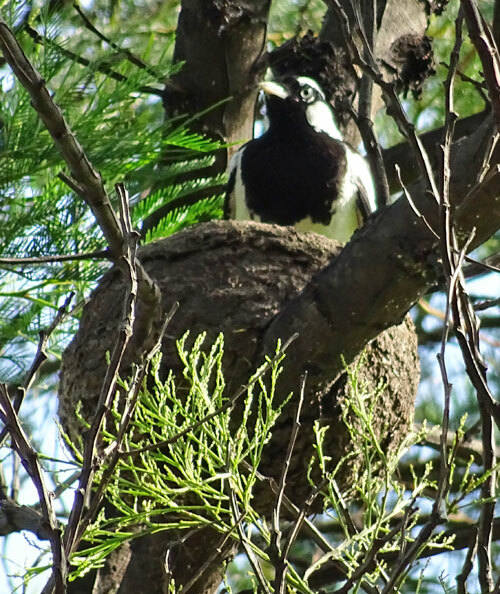 I felt extremely fortunate to spot my first Magpie-lark nest today. Even though I spend a great deal of time looking upwards, I rarely spot bird’s nests. 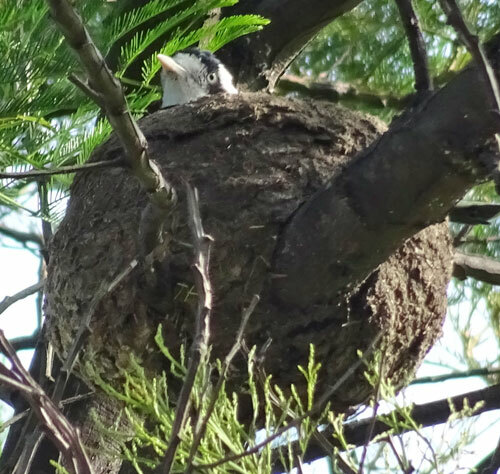 This nest was in Tempe Reserve. The parent birds were well aware of us. They took turns to go hunting for food & sitting on the nest. Although in the photos they look as though the nest swallows them up, their tail completely overhangs the edge of the nest. Magpie-larks (Grallina cyanoleuca) are Australian native birds. They eat insects, worms & crustaceans, as well as ticks if there are cows around. Their nest is built of mud & lined with feathers & grasses. This particular nest is a beautiful bowl high up in the tree. They generally mate for life & are territorial, often keeping the same territory. Now that I know where their nest is, I will keep a lookout to see if they re-use it or nest in the same tree next year. They lay between 1-6 eggs, though 3-5 is common. The chicks fledge at between 19-23 days old & are fully independent 5 weeks later. Everything is fast for birds. They live for 10 years or more & breed at 2 years of age. Magpie-larks sing duets with each other. One bird will call “tee-hee” & their partner responds with “pee-o-wit.” Only around 200 bird species sing duets, so they are pretty special. The female Magpie-lark sitting on the nest. The only movement you see is her head turning this way & that as she keeps an eye on the environment. I think they can see a huge distance from way up there. 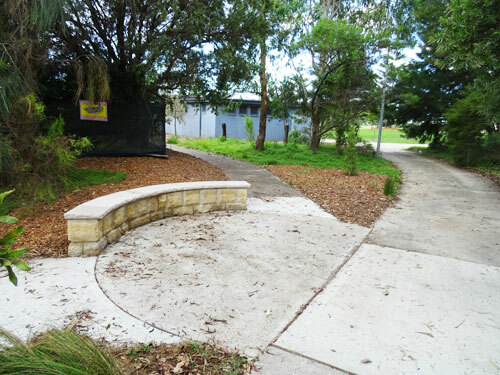 “Gathering area’ in the Cooks River Valley Garden. 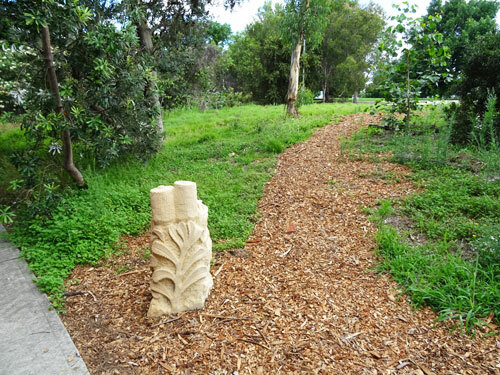 Marrickville Council has completed Stage One of the Cooks River Valley Garden upgrade & they have done some very nice things. 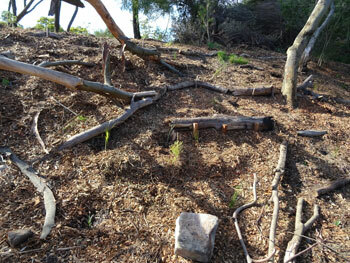 Council’s Press Release said that the Cooks River Valley Garden, created in 2001, was inspired by the book, ‘Missing Jigsaw Pieces: The Bushplants of the Cooks River Valley.’ Money for the upgrade came from a Greenspace Grant of $35,000 which was matched by Council – a total of $70,000. The first thing I noticed were the new trees. These are all around 1.8 – 2 metres tall & already make a positive impact. Once grown, they should provide much needed shade. At the western entrance, a large amount of grass has been removed in an arc-shape. 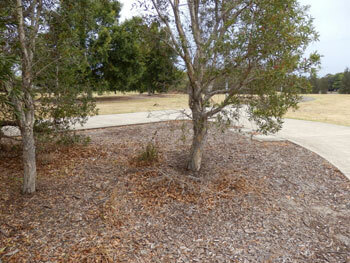 This area has been mulched with woodchip & planted with 6 new trees. 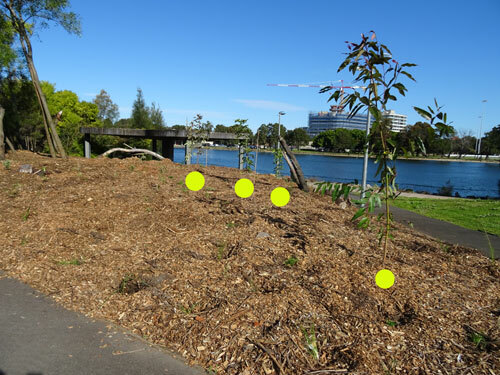 Hopefully the woodchip acts as a deterrent to people going near the trees while they are young, as this area of Tempe Reserve has a history of trees being vandalized to death. Two other trees have been planted in the remaining fenced tree spaces of which there were once seven. I can understand Council not replacing the other five until they see whether the users of the park allow these new trees to live. I hope these are replaced eventually. 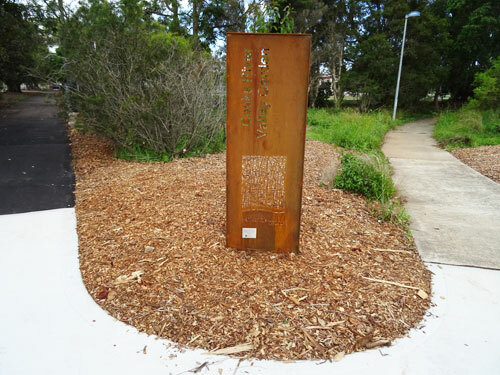 There is now an attractive sign at the entrance of the Cooks River Valley Garden, which instantly shows that this is a special place. Again, this may help lessen or stop vandalism completely. I hope so. 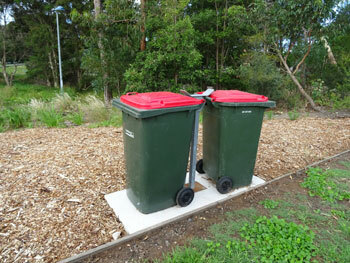 New bin holders, which will prevent bins being removed & tossed into the Cooks River. 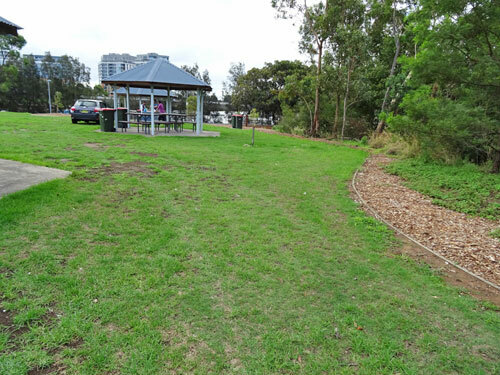 Woodchip has been laid between the Cooks River Valley Garden & the barbeque area providing a border to the garden. It looks considerably neater than previously. Quite a few dead & dying trees have been removed. I was very pleased to see that concrete had not been laid between the picnic kiosks & the garden as I interpreted from the plans. In my opinion, this is a too large area to concrete. Grass is much more attractive than concrete, softer to the eyes & the feet, as well as not heat attracting/retaining. It gets very hot here & concrete would have only made this area hotter. At the lower section of the Garden, Council has created a central gathering area constructed of sandstone, which looks nice. It follows the same design as the others that have been placed along Marrickville’s section of the river. Beside this & just inside in the garden is an delightful sandstone sculpture of Banksia flowers. It is child height, so I imagine would be exciting for kids to discover. This is a great way of including passive education regarding the environment. 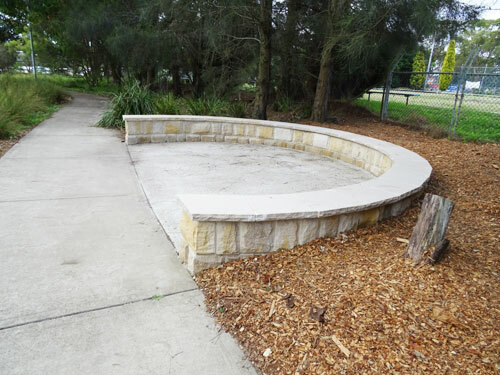 Another smaller gathering place, also in the same sandstone design has been installed at the far end of the Cooks River Valley Garden. I have no doubt that people will enjoy being able to sit in these places that offer a nice view over the garden, as well as the opportunity for peace. Quiet contemplative spaces are important in parks. I think Marrickville Council has done well with the upgrade & thank them for this. Two trees replaced in front of the picnic kiosks. I am glad this whole area was not concreted as I understood was in the plans. 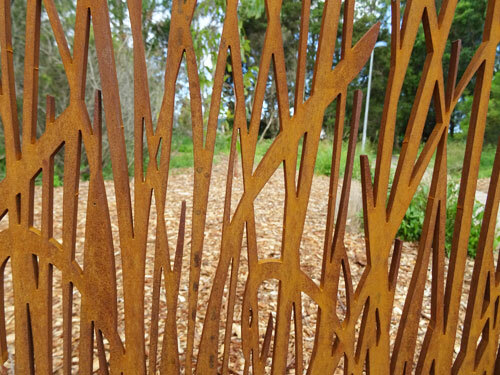 The banksia sculpture in the Garden. 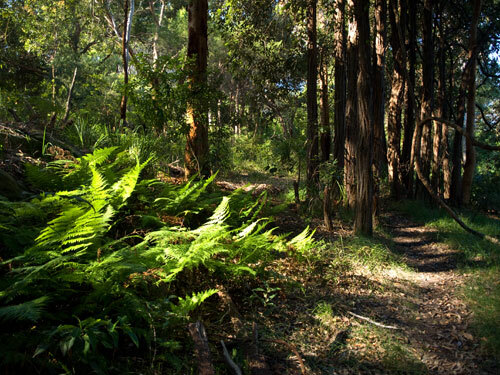 “Planning for the WestConnex M5 Extension route between St Peters & Beverly Hills is now expected to be revised accordingly.” Hopefully, this will save the Wolli Creek bushland & some 400 mature trees & a vital & important habitat for urban wildlife. 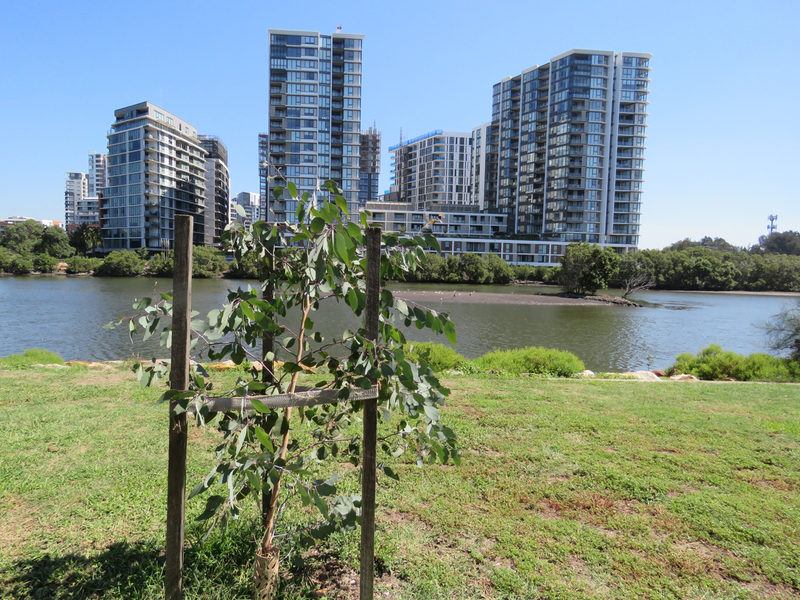 Tempe Lands, Tempe Wetlands & Tempe Reserve are all important areas of green space for the Marrickville community, especially as we have the least green space in the whole of Australia. To have a motorway go through these areas would have been a disaster for the residents of Tempe, the wildlife & the users of this green space. It makes me very happy to be able to write that it is not going ahead. Thank you to Marrickville Council for all the lobbying they undertook to obtain this positive outcome. This is in the section of Wolli Creek that is under threat Hopefully it will be untouched by the WestConnex Motorway & safe for future generations. 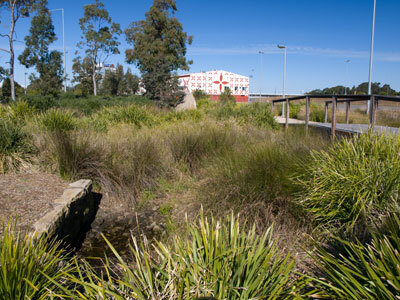 Tempe Reserve – safe from WestConnex. Cooks River Valley Garden in summer. I have deliberately chosen photos from the warmer months as this is how the garden looks when the area has more people around. The only difference is that in winter the grass becomes green. Excellent news. 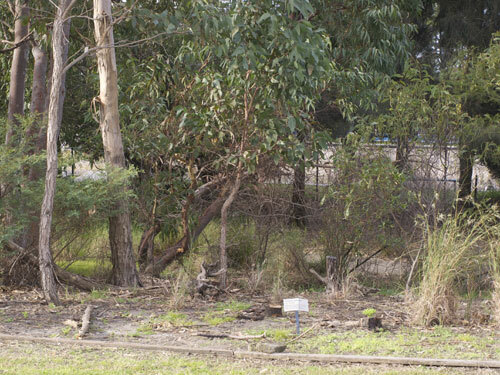 Marrickville Council is going to upgrade the long neglected Cooks River Valley Garden in Tempe Recreation Reserve. The money comes from a Metropolitan Greenspace grant of $35,000 that will be matched by Council. The work will start in August & be completed by November 2014. “Removing all dead wood/dying vegetation & a general site clean up. 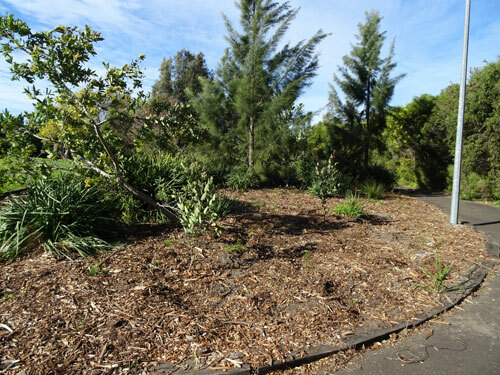 Soil improvement to all garden beds, including addition of nutrients, rotary hoeing & mulching in preparation for the planting of a range of Cooks River Valley plant species commencing in Autumn 2015. The construction of a main entry, including entry signage, paving & feature planting beds. The construction of a central gathering area formed with sandstone walling & paving. The construction of a minor gathering area highlighted with paving, feature planting & stone. Installation of a traffic control bollard. 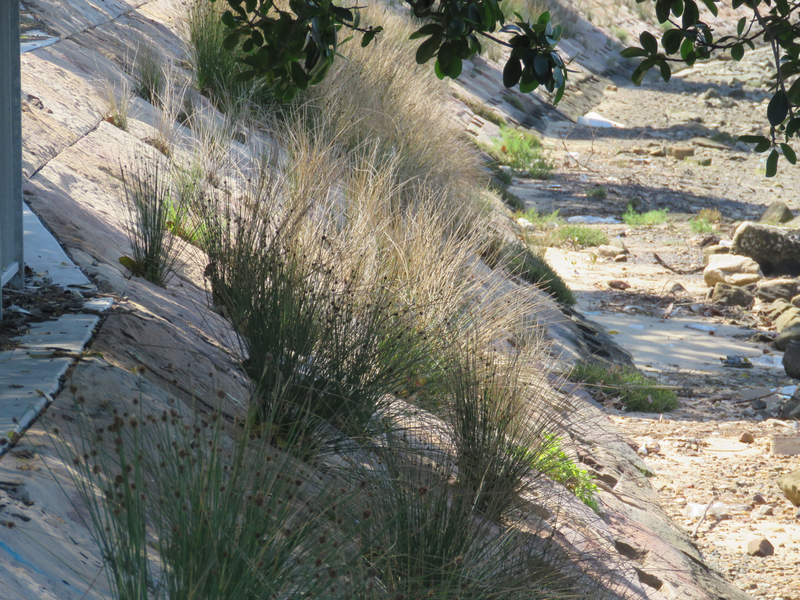 The first time I saw the Cooks River Valley Garden I was pleasantly shocked at the beauty we had stumbled upon. We had been to a Rock & Roll Market at the Jets Sports Club & wandered out the back to find a massive park & the Cooks River Valley Garden. At the time the Garden was new & still had protective fencing around it. It was lush with many of the shrubs & trees in flower. This was the beginning of a love affair with Tempe Recreation Reserve. 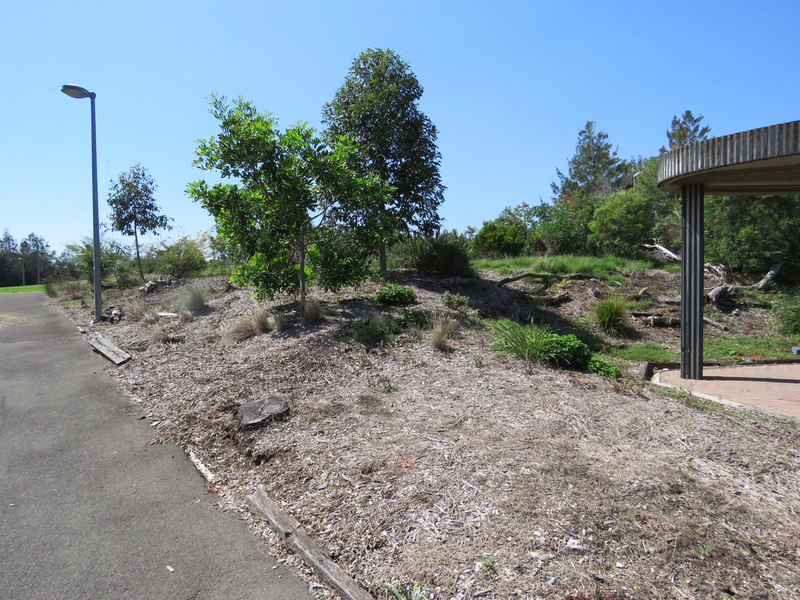 Over the years it became increasingly sad & often distressing to see the Cooks River Valley Garden disintegrate, as well as the way people who came to use the picnic kiosks treated it. I am very happy that this little patch will be upgraded. Hopefully it will be respected by those the use the area. Those of you who read my blog regularly will know that at one period I posted often about the trashing of this area of Tempe Reserve. Marrickville Council has made some vast improvements regarding the cleanliness of this area over the last twelve months (approximately). Community Corrrections now occasionally clean up litter from the users of the park. 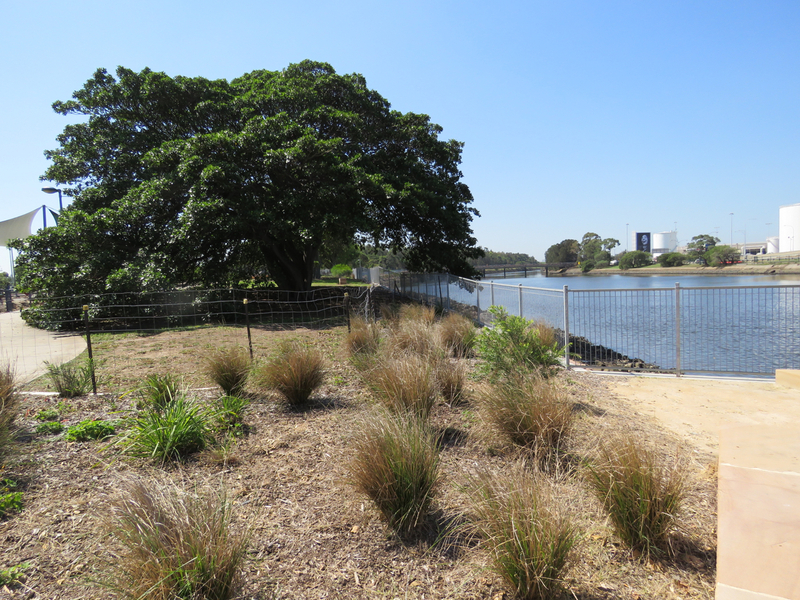 Their involvement has resulted in a vast improvement in how the site looks & also prevented much litter from entering the Cooks River. 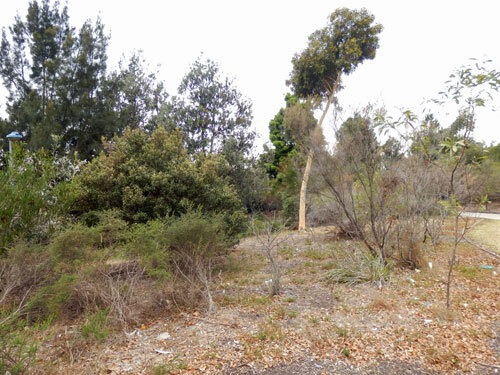 The edge of the upper section of the Cooks River Valley Garden closest to the Ring of Figs. Council also hired a company to manage the garden at a cost (from memory) of $7,000 per month. 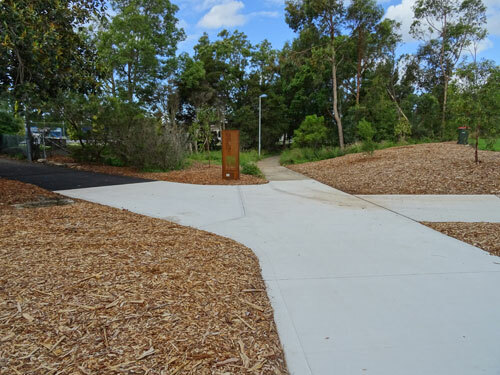 These two actions have resulted in a significant improvement for those who use this section of Tempe Reserve. Unfortunately, people still treat this area badly, but perhaps they will respect the place once it no longer looks neglected. The idea of incorporating two ‘gathering areas’ means that people can interact with the garden more than previously & this may open their minds to the beauty of the garden. 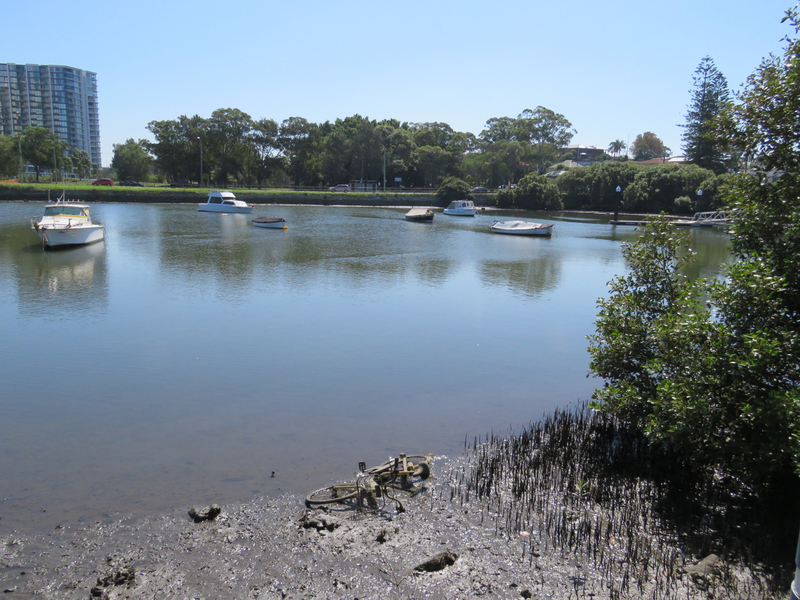 I suspect they will also create a great place for schools to visit to learn about the plants of the Cooks River. My one & only concern is the traffic bollard. 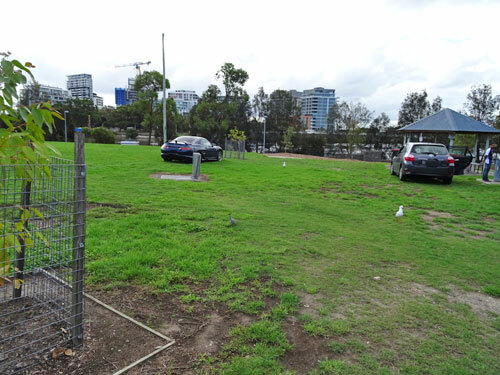 Council did install two bollards at the entrance to the concrete footpath that ran through the lower end of the Cooks River Valley Garden in response to people driving their cars through this area. Judging by the damage, it appeared that they were checking out their car’s 4-wheel drive functions. As there are already these bollards, my hope is that the other planned bollard will prevent cars from driving to the picnic kiosks directly next to the Cooks River Valley Garden. If not, I hope that Marrickville Council will take this one further step to prevent this. The presence of cars inside the park causes many problems, including damage to infrastructure. They seriously detract from the enjoyment of the park for others, so it would be nice to see them gone & for the park itself to be car-free. 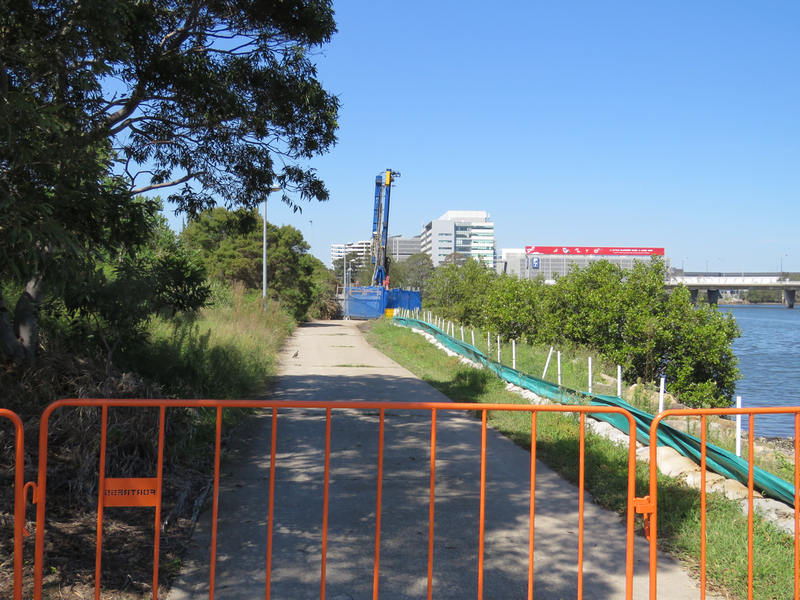 I am personally very happy that work will be done to the Cooks River Valley Garden. It was once an amazingly beautiful place & it will be wonderful to see this beauty restored. It will be terrific for the wildlife too. Thank you Marrickville Council. If you want to see the Plans, contact the Communications Team at Marrickville Council. I’ve just noticed that Council intends to remove all dead wood from the Garden. I missed this when I first read about their plans. 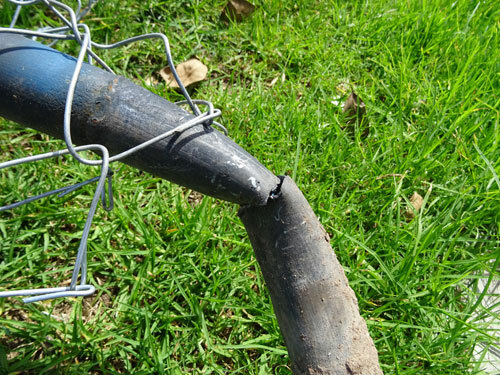 It is my understanding that Marrickville Council is now starting to put the trunks & large branches of public trees that were removed around parks to improve on biodiversity & add nutrients to the soil. 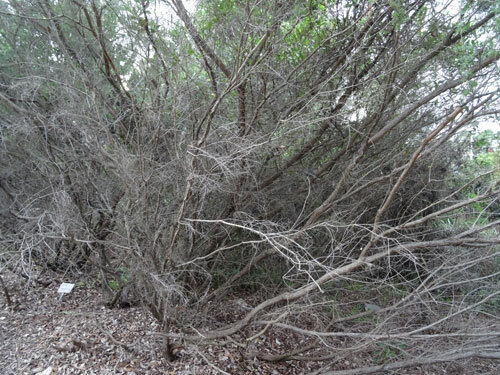 It would be a shame for the dead wood to be removed from the Cooks River Valley Garden. I cannot see any reasons for doing this other than aesthetics. The dead wood should remain to be of benefit to insects & other wildlife, as well as fungi & improving the soil. 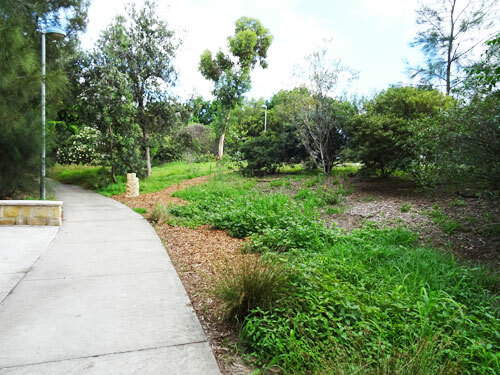 Cooks River Valley Garden – upper side. Area close to the bins. The old Jets Sports Club can be seen in the background. 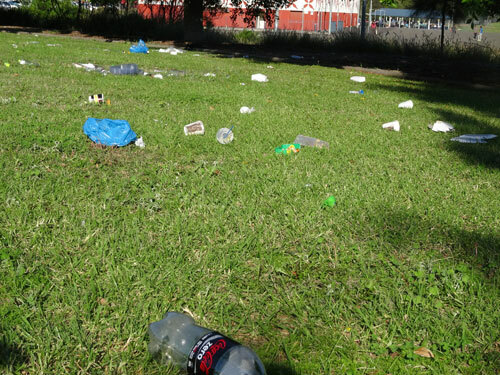 This was Tempe Reserve at 4.30pm yesterday after a community festival was held here last Easter Saturday. Words fail me. 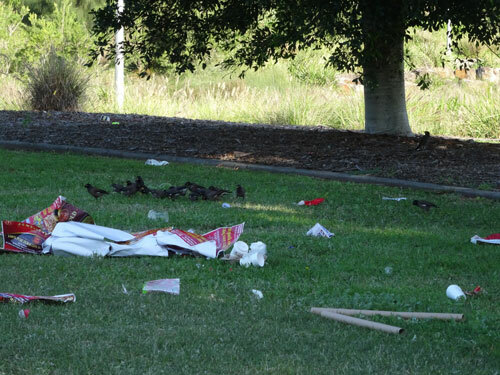 This is not okay for the community who did this, or for the people who come to relax in the park & it is definitely not okay for the wildlife & the Cooks River where a lot of this garbage ends up. I do not understand how they could have walked away leaving such a mess. Nor do I understand why communities are allowed to hire this area when they leave such a mess & put the river at a huge risk. Surely it is reasonable to expect respectful use of the space & that it be left in the condition it was given to them. As a minimum, organizations that hire our public spaces & disrespect them should be made to pay an upfront fee in order to cover the cost of cleaning up after them. It was not a place suitable for community use yesterday – on a sunny Easter weekend when it is expected that a lot of people will go to the park. We don’t go to the park to sit or play amidst other people’s litter. Tomorrow is Earth Day where we celebrate this great planet that we live on & the environment. It’s obvious that there is still a long way to go in terms of some people respecting the environment.